Given all the ramen popping up in spaces all over the globe, it’s quite unfair to call one ramen or ramen shop as the best. Each ramen shop has their own specialty. You just can’t compare a tonkotsu ramen to a shoyu ramen. 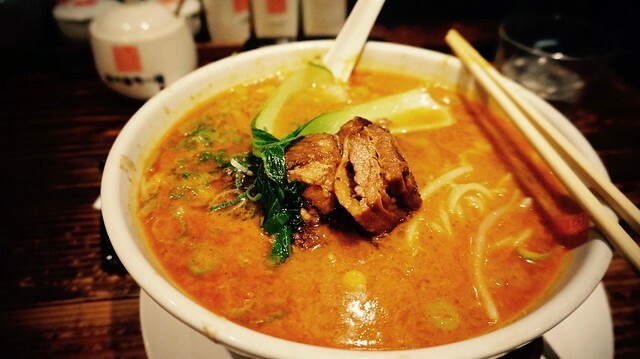 Nor can you demand an answer on who makes the best tonkotsu ramen — Ichiran or Ippudo? Each bowl has their own character and I think each bowl merits a bit of our love and attention. That said, there are few exceptional bowls that have taken my heart. If I can take a bowl to a dance, then it will be this bowl — my oshiawase (happiness) ramen — Sisen Ramen’s Charsiu Tantanmen in Umeda’s Gourmet Museum. It breaks my heart to say this but this ramen was not the first ramen that made me giddy and happy. It was actually a Gomoku Ankake Ramen from Makati’s Nihonbashitei, a luscious ramen with a wonderful balance of flavors and richness. And for a while that Gomoku Ankake Ramen made me hum a happy tune until my wonderful friend T decided to take me to her happy ramen place. The sign to Hankyu’s Gourmet Museum. Sisen Ramen is located inside Hankyuu Umeda’s Gourmet Museum. When my friend first took me to this place in 2010, it was as easy as hopping off the Hankyuu, finding the Big Man, and heading down the escalator towards the Gourmet Museum. These days, finding this shop in the madness that is called Umeda Station is close to impossible. During my last visit to Osaka, finding this shop in the labyrinth that is Umeda Station was hell. My piece of advice: look for the Gourmet Museum at the 2nd Basement of Hankyuu’s Sanbangai, find the north hall, find the fountain, and see the wooden shop past the fountain where there’s possibly a line of people outside. It’s no. 15 on this map, if it helps. It also helps to be just on the verge of being too hungry because you wouldn’t want your impatience to ruin your meal. You will be passing lots of awesome restaurants along the way and it will definitely be tempting to just skip the hunt and forget this place altogether. However, as my friend T told me, this ramen will definitely ease all your hangry away. It is our ‘oshiawase ramen’ for a reason. I tend to time my visit just a little before (11:30) or after lunch (1:30). By then the lines would be close to non-existent although during my last visit, 3 pm appeared to be the obachan hour. When I’m around, somehow, all the old ladies gather. The shop’s menu is quite simple. 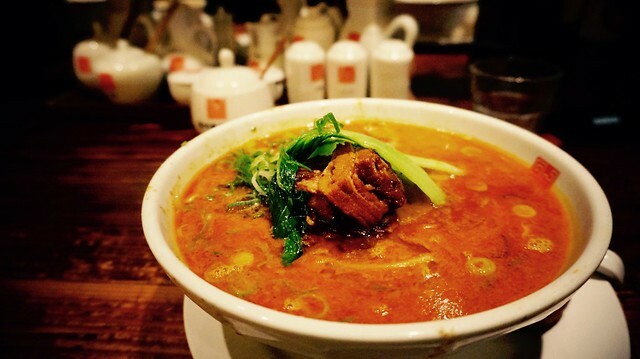 They have five kinds of ramen, all of which are variations of tantanmen, a Szechuan style spicy ramen. 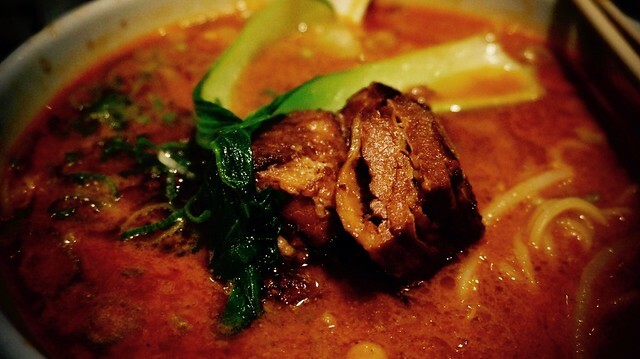 The ramen most relevant to me is the Charsiu Tantanmen, a tantanmen with a block of roasted braised pork on top. This comes in a regular flavor (moto aji) or the spicy flavor (karakuchi). If you can’t take the heat, just choose the moto aji. However, I strongly recommend the karakuchi because it just ain’t tantanmen if it’s not spicy, right? There are also lots of awesome sides (from soft-boiled eggs to gyoza) and if you come in during lunch you can even try having your ramen the Osaka way — a set meal with a bowl of fried rice. If you’re up for double carbs, go for it. In terms of sides, the shop also offers a set of pickles for free, from gari (pickled radishes) to takana (spicy pickled mustard greens). I usually snack on these while waiting for my ramen, just enough to whet my already drooling tongue. My darling Charsiu Tantanmen. You can see the various vinegars, sauces, and pickles at the back. Minutes later, happiness arrives. It first tempts me with the steam rising from the soup. Then, the scent of the broth hits me with fragrant spices. I look at the bowl for a short while, enough to admire the vibrant bokchoy and the glistening oil over the meat. It looks daunting, to be honest. The fiery red broth intimidates my senses, building my anticipation for a heat that will burn my mouth. Seconds before I dip my spoon in, I am filled with worry. Will I die? Will this broth be spicy enough to kill me? During my last few returns, I worried if it was as good as I remembered it. I have had my fare share of disappointments in life and I didn’t want this charsiu ramen to be one of them. The first slurp of the broth immediately eases my worry. Instantly, I am taken to a happy place as the broth tickles my tongue and warms my body. Just look at these beauties swimming in that lovely broth! Also, I apparently ate a bit of this before remembering I had to take another picture. OTL. What I find spectacular about Sisen’s Tantanmen is the wonderfully balanced broth. The problem with anything spicy is that it usually burns your tongue that you can no longer enjoy anything else apart from the spice. 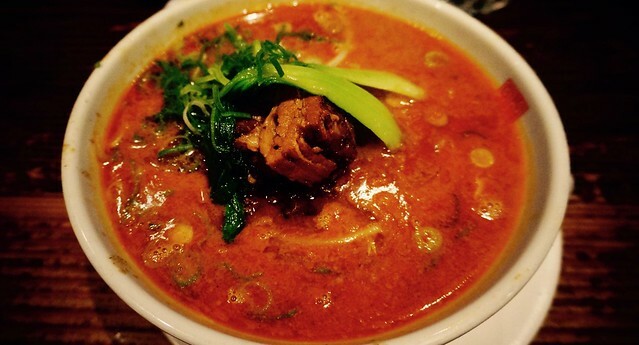 However, this tantanmen has a hum of heat that is as comforting as a a peppery chicken soup. At the same time it has a rage that is as exciting as a well prepared curry. The soup, while rich with flavour, was light to my tongue. It wraps my tongue as if leading it to a salsa. It starts with light steps. The heat slowly builds up but you enjoy the dance enough to bask in its embrace and note the subtle sweetness in the broth. As the dance continues, body chemistry just takes over and you’re just basking in the warmth of this ramen. I know I’m in the right place when I feel my lips tingle and sweat begins to trickle down my nape. At this point, I take a glug of water, overwhelmed by that first heat. However, this dance is far from over. The second heat is all about the springy noodles and the crisp vegetables. Together, they complement the rhythm of the broth, like kicks and turns that makes a dance more exciting than the last step. The noodle for this ramen is springy and has a nice chew and mouthfeel as you slurp it in your mouth. The best part about it is how it carries the broth really well. Even when you’re not slurping the broth, the noodle continues to give the warmth that broth provides. The crisp moyashi and bok choy are give nice break from the rich broth, enough to let you gather your breath before continuing to the next heat. How can you not love this charsiu!?! The finale is the beautiful charsiu. This charsiu has a complex umami flavor born possibly from a deep dark soy and five spice braise. This sweetness is heightened by a light roast which caramelised parts of the charsiu. When I bite, more like, when I take a piece of this charsiu and let it melt in my mouth, my world turns over. The sweetness against the spice of the broth is just bloody wonderful. As I write this, my body reacts to the memory. My eyes closing as if all these flavours are swirling in my mouth as my lips form a smile on my face. My friend T took photos of my first bite when she brought me here in 2010. I apparently didn’t care enough how I’d look when I was blown away by this bowl. But after this, I completely understood why this made her very happy. This ramen is awesome. For me, no other ramen deserves the name ‘oshiawase ramen’ but this. Rarely do I get a chance to eat a ramen, let alone a meal, so well-balanced where everything about it has a purpose. Like a well choreographed salsa, this Charsiu Tantanmen is wild and it leaves me breathless. I often find myself staring at my empty bowl, contemplating if I should get another. It really is tempting to get another bowl but I often stop myself thinking that there will always be a next time. And there is always a next time. I agree! @ unfair comparisons. A lot of it feels like the limits of my own preferences (like I’m weak against spicy food or super fatty food) so I just have a few places I’d go back for a comfort meal. I realise that palettes change over time. These days, it breaks my heart that I’m so picky with french fries when there was a time I’d eat anything fried. In fact, that’ll be the last thing I’ll order. But palette’s changing is always a good thing. New flavors to enjoy and love for the next years.